2.1 Is On page optimization necessary to rank your webpages? Is On page optimization necessary to rank your webpages? A process in which various components of a single web page for a given keyword or a phrase starts getting noticed by the search engines is known as On-page Optimization. On page optimization is one of the basic step to search engine optimization. These factors work on the page of your website to improve your search engine rankings. These factors can be controlled by the webmaster or by the coding of the page. On page optimization is an important component of SEO. Without it, it’s difficult for your website to get noticed. On page optimization a basic pillar for successful SEO! As we said earlier, On page optimization is a foundation for successful SEO. On-page optimization helps you to rank well in the Search Engines and also helps in improving the overall readability of your website for your users. On page optimization is very essential to gain visibility in the search results as without optimizing your on page factors, you won’t be found in the Search Engines. Without on page optimization of your content which talks about your website, there will be less chances of your website getting authority leading to, you missing out on traffic. If you lack on, on-page optimization, there are less chances of you getting notice, which will again lead to low conversion rate. Just to avoid such circumstances, it is always better to start optimizing your on-page factors. On page optimization techniques for better rankings! Proper content of the Page: The content written for your website should be unique and relevant. Search Engines look for this only. ‘Content is the King’, it is rightly said as the ranking of the website is dependent on the content of the webpage. The content should be engaging enough that it attracts the users. In fact, Search Engines penalize the websites which are not updated regularly with the current information. The webmasters should make sure that while creating a website, the content should be logical and should consists of those keywords which will help the website to be easily traceable. 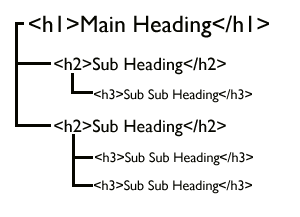 Heading Tags: The headings of the page are created with <hn> tag, where n is a number between 1 to 6. Generally, there are 6 fonts used for heading. You should use tags such as h2, h3, and h4 to highlight your headings, sub headings. Your h1 tag is used only once, which is your title. Also, don’t use h2 or h3 tags too frequently as Google may penalize you for doing a negative SEO practice. Let’s hear what Matt Cutts say about H1 tags. Title Tags: It is an HTML tag which is used to define the text or the title of the search listings which is on the top of Web browser. The title should be accurate and should give a brief of the page’s content. It should not exceed 65 characters. The tag is very essential to each and every website and it’s web pages, and each webpage should have a different Title tag. Title tags play a very vital role in optimizing your page in search engines. URL Structure: Another important aspect in Search Engine Optimization is that the URL structure should contain the main keywords. Keep your URL short, self descriptive and rich with keywords. Keyword Density: It is defined as the percentage of keywords or keyword phrase that appears on your webpage. A percentage up to 1.5% with mix of LSI keywords is ideal. Try using your main keywords in once in first paragraph and then in last. Use font style like bold, italic and underline to highlight. XML Sitemap: It is always advisable to have an XML Sitemap as it permits a Search Engine crawler to index the list of URLs for a website. A XML file contains only 50,000 URLs and size must not be larger than 10 MB. Proper HTML and CSS Validation: It is essential to have a good HTML and CSS validation done for your websites, to enhance the UI for any visitor coming to your website. A website with good HTML and CSS validation will eradicate all the bugs and glitches, thereby enhancing the experience of the user. Alt Tags: To increase the ranking of the web page, it is essential to attract traffic through images by using the correct and relevant Alt tags for specific keywords. Include targeted keywords in the image alt text and image name. The images makes the blogs more interesting. Try to look out for small to medium size image and bigger images will slow down your speed. Internal Linking Strategy: Internal linking strategy defines that the web pages of any website should be properly interlinked with each other. The linking should be done wherever it is required so that the Search Engines does not spam it. The major pages of your website should be linked with the homepage. Moreover, You can also link your related blogs from your blog to send extra traffic and increase page rank. But don’t overdo it. Did you know there is a tool to ease out your on page optimisation difficulty! 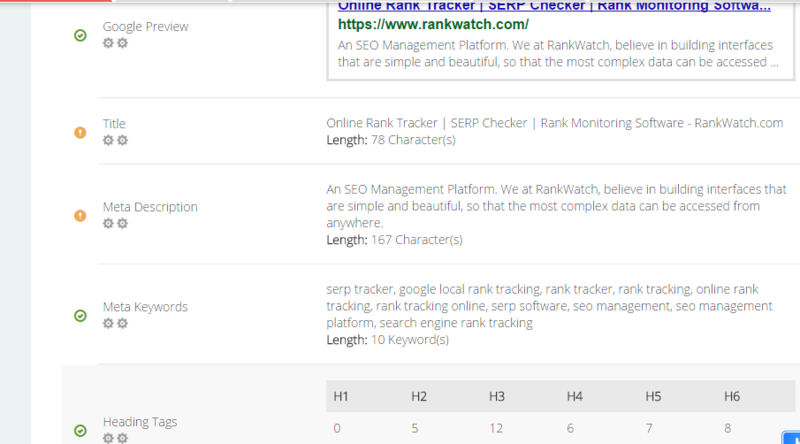 RankWatch helps you to analyse your complete website. Where are you going, what wrong or right you are doing with your website. Check whether your onpage factors are going right or not. On-Page Optimization undoubtedly is a pillar for SEO. If even one pillar fails in having solid base, it will definitely collapse. Hence, On page optimization is a very important aspect of successful Search Engine Optimization. Whether it’s crawling of search engines or indexing the pages or may be improving the ranking of the results, on-page optimization plays a major role in SEO success.